This week at the Tiddly Inks challenge blog we want to see YOUR inner Diva! I am about as far from a Diva as one can imagine - but my soon to be 8yr. old - well she's got that attitude that doesn't stop...so I thought of her when I made this card! Her favorite colors are pink and black together...I've used most of my Echo Park paper that's pink and black so I decided to go out on a limb and make my own. I cut a 4.75 square of white card stock and penciled in the word Diva at the top. I then outlined it and with a few Tim Holtz inks - worn lipstick and shabby shutters I painted the word. Then I used my cranberry glimmer mist on the whole thing. I dried it with my heat gun and then took some Teresa Collins clear stamp alphabet letters and stamped Diva all over. I then added a swirl pattern from Inkadinkadoo stamp set and accented a few letters and swirls with white gel pen. While this was drying I colored this ADORABLE little Diva called By Royal Decree in my Copics. I punched some flowers and layered them. I added a number rhinestone for some shine because honestly what's a Diva without a little bling? I also had these little royalty charms that I bought from Michaels a while ago and decided to add those too! 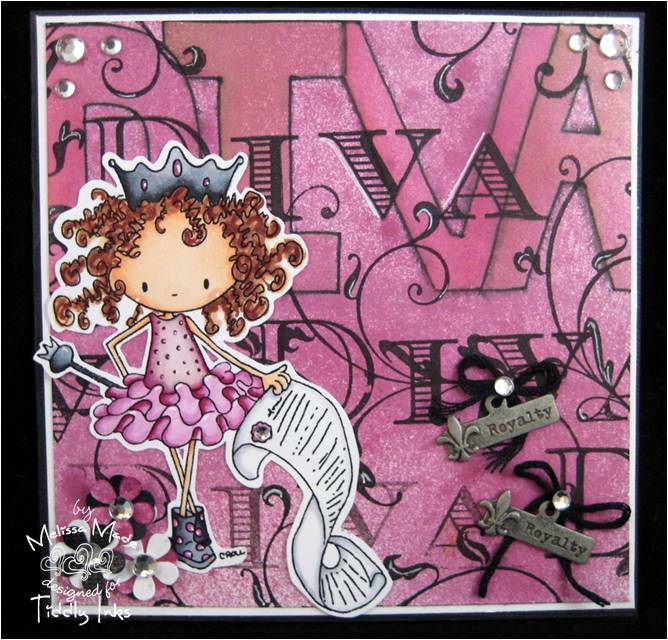 Head over to the Tiddly Inks store and pick up a DIVA of your own and join us for our Tiddly Inks Challenge! Melissa!!! I LOVEEEEEEEEE that you made your own DP!!! Gorgeous hon!!! Great colors! Your 8 yo has good taste just like her Mom!! Great card Melissa! 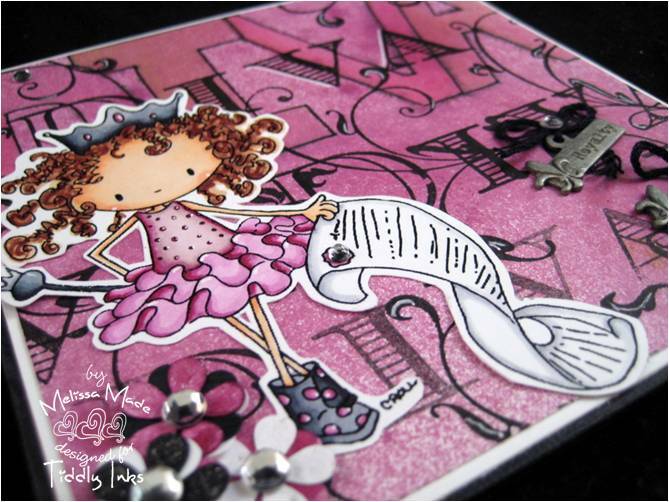 Your own design paper is fabulous! Great card!!! 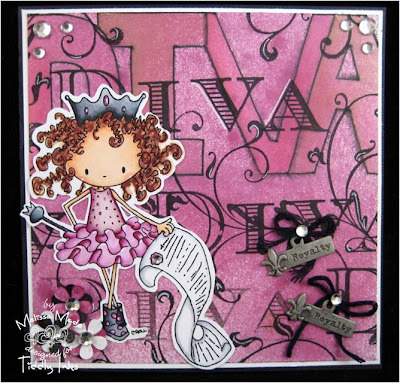 Love your paper technique...great job on that! Super cute all around!!! Your homemade paper is gorgeous. It sounds like it was a lot of work, but it turned out beautifully. I love the little royalty charms. This is so fabulous! I LOVE the paper you made...I would totally buy it! =D Wonderful job! This is just amazing! 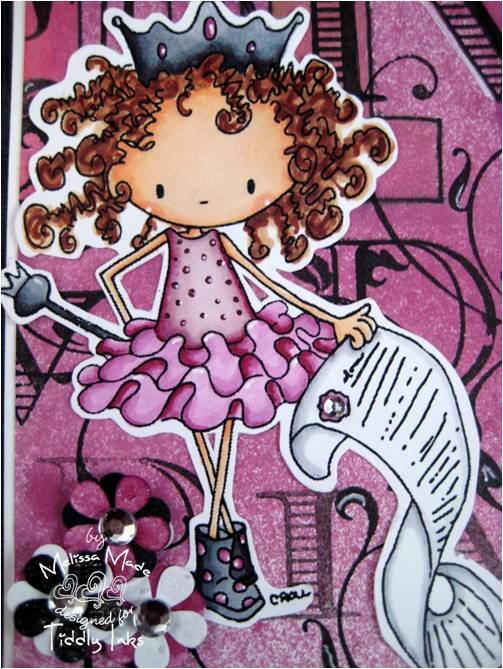 I ADORE that paper you made... it's so gorgeous and you did a beautiful job on it. That's a GREAT idea! So creative!! LOVE this! 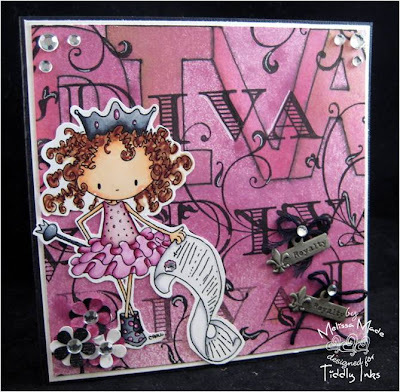 This card is perfect for a DIVA of any age! Your paper is just fabulous, it's truly amazing! I think you have a little inner Diva and don't even know it! Oh my gosh you made that paper.....AMAZING!!!!! As soon as I saw your image I immediately thought of my soon to be Miss 7 who is a little diva at the moment. Your whole card is perfection!! Awesome! The colors are fantastic and I really love that background paper!